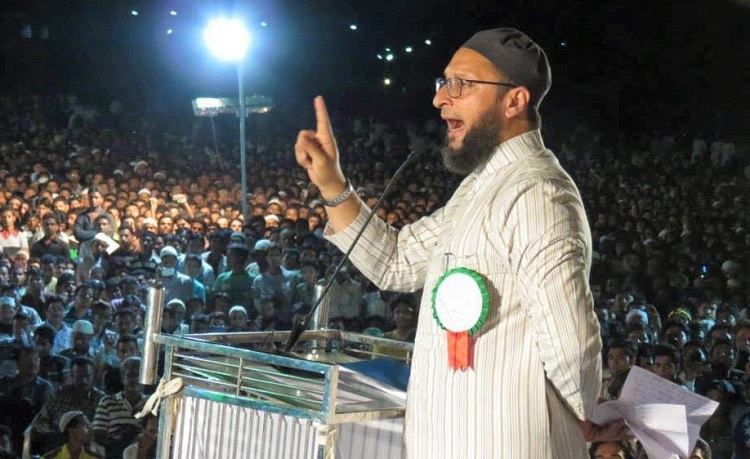 Uttar Pradesh: All India Majlis-e-Ittehadul Muslimeen (AIMIM) Chief and Hyderabad MP Asaduddin Owaisi on Monday accused the Samajwadi Party (SP) government in Uttar Pradesh of plotting Mathura violence and demanded a high level enquiry. The firberand AIMIM leader also repeated that the Samajwadi Party (SP) and the Bhartiya Janata Party (BJP) are two sides of the same coin, and vowed to defeat them in the upcoming state elections. Slamming the Samajwadi Party (SP) government in the state over its refusal to give permission to his rallies, All India Majlis-e-Ittehadul Muslimeen (AMIM) Chief also said Mulayam-Akhilesh father son duo are afraid of him. Owaisi said that he was a bigger star than Salman Khan – with whom the Samajwadi Party (SP) leaders take pride in having lunch, but are afraid of his rallies. “The SP government is afraid of me because it doesn’t have answer to the questions I raise”, Owaisi said in Moradabad on Monday. “If Bajrang Dal and Vishwa Hindu Parishad can get permission to organise arm training camps, why not to me to address a public meeting?” Owaisi asked. “The Samajwadi Party (SP) has not only cheated Muslims, it has also drifted away from the ideology of Sociailist leader Ram Manohar Lohiya”, he said. “In this government, only one and a single family is enjoying all benefits not anyone else, No Muslims, no Dalits only a single family is taking all benefits”, he said. Owaisi was in Moradabad to attend a Ramzan Iftar Party organised by the AIMIM Uttar Pradesh unit. The Ramzan Iftar held at Jama Masjid Park was also attended by AIMIM Uttar Pradesh Chief Shaukat Ali besides other party leaders.